Well just a quick post from me. A couple of weeks ago I registered as official blogger for Indonesia Fashion Week 2013 on their website. On 21 January, one of IFW crew sent me an email to do the next requirement. The requirement was I have to put IFW banner on my sidebar. On 28 January, IFW sent me an email and informed me that I am one of the official blogger of Indonesia Fashion Week 2013. Yeaaay! And another excitement is my friend Lulut Marganingtyas also being the official blogger too. YEAYS!! 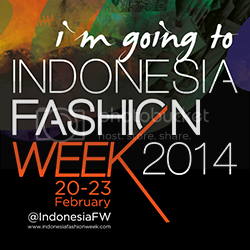 This is my very first time attending IFW. About 2 weeks to go, I just can’t hardly wait for IFW 2013.
is your necklace heavy or not? Me encanta el collar es precioso!!!! nice outfit!! öpve that skirt! Congratulations! Have fun at fashion week. The necklace and a skirt are super cute! so unique and beautiful outfit! !thank you so much for your comment!kisses!! Wow congrats! Nice outfit too! Very cool. Love the coat. Congratulations!!! You will enjoy it so much :) Have a great day! The colors on the necklace goes so perfectly with the galactical skirt! Very cool outfit. ihhh mbak berthaaa main blogspot jugaa ya sekarang.. kamu tambah cantik loh yaaa! hihi. This is a really cute outfit! I like it very much. iyaaaa mbak berthaaa aku udah lama main blog. hihi. aku follow kamu yah. kamu kenal winda juga yahh. winda kan dulu temen SMA akuuuu. dia di lspr jugaaa. Very cool! I love how the necklace picks up the colors of the skirt!